Stop with the frantic cleaning sprees in an attempt to sanitise your whole home for the visit of your friends. Have the nice and welcoming clean conditions at home every day, without moving even a finger with the help of our professional cleaning services, which we deliver in Greater London. But our cleaning is not only focused on the beauty of your home, but also on the healthy atmosphere. Where we truly stand ahead our competitors is the devotion to our work. We know that the home can be the source of great stress, when it is not in proper conditions and that’s why we have endeavoured ourselves to take care of all of your cleaning problems at home. Our passion for details and excellence will astonish even the most demanding of you. Give us a try and you will get only professionalism in return of your trust. Great deal, isn’t it?! We are involved in the cleaning business long enough to know all the ins and outs of the trade. That’s why we have expanded our horizon and now our professional cleaning services cover all type of needs in Greater London. Our performance is just unbeatable, because we have the needed knowledge to treat all type of surfaces in the most efficient way. 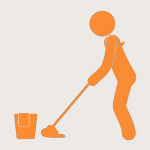 The cleaning experts, who we collaborate with, are an integral part of our success. We highly value their interpersonal qualities and their comprehensiveness. To enrich their knowledge, we provide them with advanced training on regular basis. They take pride in their job and do it with pleasure. What is unique about them is that they work a whole, without making a hassle in your home. You won’t even feel their presence if you don’t want. We completely take care of the fragile surfaces, since these require special cleaning products. These hide no harm to the health as well, since we always go for green cleaning solutions. Our professional cleaning services in Greater London are flexible to cover all of your needs at once. That’s why ask our friendly assistants for our discounted cleaning packages and don’t hesitate to book from Monday to Sunday, at a convenient time for you. We never charge extra for the pleasure to have us on weekends or holidays, because our mission is to keep your interests intact. © 2019 Cleaning Teams London | Professional Cleaning Teams in London area. All Rights Reserved.